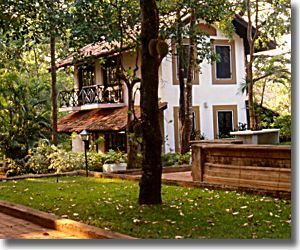 A visit to any of the Keells Resort Hotels, staffed by well-trained personnel, greets you with luxurious comforts, delicious tropical island delicacies and that feeling .. of you have discovered paradise. On the beach, in the hills or near Heritage Sites in the lake country, each of these Hotels at a picturesque location, is an ideal base from which to explore the natural beauty of this enchanting island. 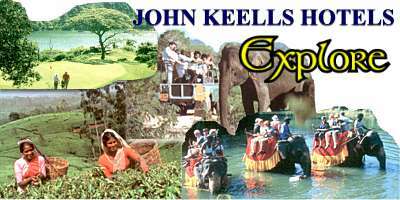 KEELLS RESORT HOTELS Website <<< Click here now!! On this tour England will first play Three One - Day Internationals before the commencement of the three - test match series. The 1st will be in DAMBULLA at the Rangiri Dambulla Stadium. Then the 2nd and 3rd both D / N matches, are in COLOMBO at the R. Premadasa International Cricket Stadium. * R. Premadasa International Cricket Stadium, Colombo. * Rangiri Dambulla International Cricket Stadium, Dambulla. Please note that this page shall be next updated to include the Three Test-match venues. "rose from the marsh !" There are many instances in the history of human endurance where tasks that looked to be impossible, have been accomplished by men harnessing their energies motivated by proper leadership. Due to the far reaching vision and sincere commitment of a true leader we had in the late Honourable Ranasinghe Premadasa, the then Prime Minister of Sri Lanka, in 1985 we have witnessed such an event here. It was another project conceived and executed successfully by him, within a remarkably short period of time. On marshland where in time immemorial, Buddhist priests used a small boat in rainy moths to go across to their temple at Kettaramaya area of Colombo, rose unbelievably sphinx - like, quite unobtrusively and unnoticed, the gigantic cricket stadium we see to day, in all its grandeur. What makes this so unique and remarkable? Is it because it happened to be the biggest and the largest full fledged Cricket Stadium in Sri Lanka with a seating capacity for 40,000 spectators, all afforded with shelter under permanent covered tiers ? Certainly not. Its all because, this awesome structure in the heart of the city of Colombo on a land that was marshy just 5 years ago, has been completed in the space of just 166 days ( yes its one hundred and sixty six days ! ), work having commenced on 18th August in 1985, and that too without the services of foreign experts and at no costs to the Sri Lanka Cricket Board (BCCSL). It escapes my imagination to believe this story, incredible and amazing, how a marshy land has been transformed in such a short period of time to a 'cricket wonderland' of this magnitude and splendor. A section of the marshy land covering around 20 acres of area adjoining the Buddhist Temple at Kettarama situated in the north of Colombo, was reclaimed in 1982 to form a playground for the Recreation of the common people living the housing schemes around there. It was also the time that Sri Lanka had gained recognition as a full member country of the ICC and thus a test cricket playing nation. Hence the country was committed to play regular international cricket and the major undertaking given then was that infrastructure for Cricket in Sri Lanka would be rapidly developed to provide the match venues and facilities, all measuring up to international standards. It was also the time when Cricket, once thought of as a game indulged in by the elite, was becoming popular even with the common masses. The need to improve the infrastructure facilities of the game and the creation of a National Cricket Stadium of our own conforming to international standards with improved facilities for players and spectators, was foremost in the mind of the then Prime Minister Honourable Ranasinghe Premadasa. Kettarama being centrally located, became the appropriate venue for such a Stadium, but its ground and surrounding conditions looked a stumbling block. In order to save costs, the Colombo Municipal Council together with the relevant agencies under the two Ministeries, the Ministry of Local Government, Housing and Construction and then Highways, both under the Prime Minister, pooled their resources to perform admirably. The architectural and structural design and construction commenced on 18th August 1985 and completed all work for commissioning in six more months time. This feat is a great tribute to our local engineering and multifarious technical skills and sound workmanship, ably handled and coordinated by the then Engineer of the Colombo Municipality, Mr. Marasinghe Perera. The Chief Architect then of the Colombo Municipal Council, Mr. Lester de Silva, has proved that a Sri Lankan could design a world class project unassisted by foreign experts. It was a task realized through dedicated team work and a monument to local skills. Pakistan Captain Imran Khan in his first visit there, was amongst many who had paid the highest tribute in saying that " this is one of the best Cricket Stadia in the World." 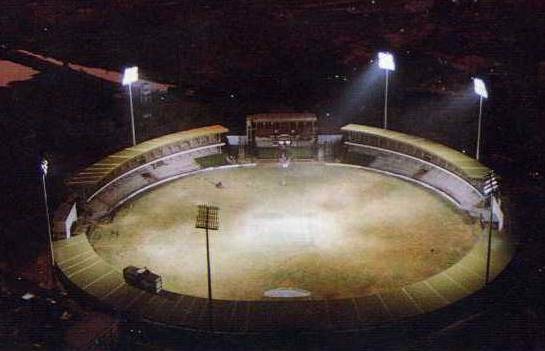 Kettarama International Cricket Stadium was commissioned on 2nd February 1986, when a Sri Lanka 'A' led by Arjuna Ranatunga played an England 'A' led by Mark Nicholas and scored a memorable four-wicket win in a 45 overs match. It was also the desire of the Honorable Prime Minister Mr. Ranasinghe Premadasa to floodlit this Stadium. Five years later, when he was the President of Sri Lanka this dream became a reality. With the help of the State Engineering Corporation and the Ceylon Electricity Board, four stage lighting system comprising of six towers of 50 meters high with 538 lights of 2 KW each supplied by Siemens of Germany, was installed. Our National day 4th February in 1991, saw the Commissioning of its flood- lighting system to banish the shadows of the night. Hence Kettarama International Cricket Stadium became the first International Sports Stadia in Asia with such facilities. Even in Australia then, there was only the Melbourne Cricket Grounds (MCG) with floodlight facilities. FITTING TRIBUTE TO AN ASTUTE LEADER. The 70th birth anniversary of this great visionaries President of Sri Lanka, who was by then had been killed on 01st May 1993 by another suicide bomber on his way walking to address the May Day workers' rally, was commemorated in a fitting manner when Kettarama International Cricket Stadium was renamed R. Premadasa International Cricket Stadium and Sports Complex, on 23rd June 1994. KEY INTERNATIONAL MATCHES PLAYED HERE. 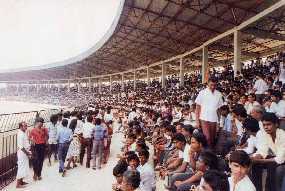 In one of the largest spectator gatherings seen for any sport in Sri Lanka, a Sri Lankan XI led by Arjuna Ranatunga, scored a memorable 4 - wicket win over an England XI skippered by Mark Nicholas, in a 45 over match to inaugurate the then Kettarama International Cricket Stadium on 02nd February 1986. England XI put into bat first, relied heavily on Bill Athey's innings of 70 scored off 98 balls with 6 fours. Sri Lanka's brilliant ground fielding restricted the England batsmen to a total of 178 / 9 off their 45 overs helped by Martin Moxan (29) and Chris Smith (28). In replying, opener Marlon Von Hagt (38) set the tempo in style, averaging nearly five runs in the first five overs. But with Derrick Pringle (35 / 3) and Nick (N.G.B.) Cook (22 / 2) claiming two wickets each, half the Sri Lanka side was out for 97 in the 27th over. The turning point of the match came in a vital 6th wicket partnership of 56 runs in just 10 overs featuring man of the match Roshan Mahanama (39 n.o. in 45 balls with 1 x 4) and Athula Samarasekera (26 in 32 balls with 3 x 4s), both running superbly between wickets. Romesh Ratnayake (18 n.o. in 16 balls with 1x6 and 2x4s) then made the finish live long in our memories by making the winning hit - a six over long-off in Tim Tremlett's 8th over, to reach 182 / 6 / 41.2 overs to win by 4 wickets with 22 balls to spare. The first ODI scheduled to be played here, was on 9th March 1986, the 3rd ODI against the visiting Pakistan team. But this was rained off without even a ball being bowled. The 58th match in the Sri Lankan ODI history played on 05th April 1986 thus became the first ODI that was played here. It was the 1st match in the John - Player Triangular Tournament game, Sri Lanka vs New Zealand. Sri Lanka team Captained by the top scorer Duleep Mendis (24) managed just 137 / 9 / 43 Overs. Helped by a 34 from Ken Rutherford, Kiwis reached 140 / 4 off 36.2 overs to become easy winners by 6 wickets. THE FIRST DAY / NIGHT ODI. On 5th September 1992 Sri Lanka in their 135th ODI led by Arjuna Ranatunga, played their 3rd One-Day International of the 1992 series against the visiting Australian team captained by Allan Border. Helped by a 49 from Asanka Gurusinha, Sri Lanka made 207 / 6 in their 50 overs. Man of the match David Boon (69) then paved the way for a 5 wicket win by the Australians in reaching 208 / 5 in 47.5 overs. Pakistan made 319 / 5 against Bangladesh in 1997. England made 298 / 8 against Zimbabwe in 2002 / 03 and then again 269 / 7 against India in 2002 / 03. For Sri Lanka, its their 302 / 4 in 1997 and then again 301 / 10 in 1998, both against India. Sri Lanka were bowled out for just 98 by South Africa in 1993. Sri Lanka in return bowled Holland out for 86 in 2002 / 03. The four leading centurions for Sri Lanka are, Arjuna Ranatunga (131 n.o.) vs India in 1997, Sanath Jayasuriya (120 n.o. )vs India in 1996, Mahela Jayawardena (101 n.o.) vs England in 2001 and Marvan Attapattu (118) vs India in 1997. Marcus Trescothick had made 119 for England against Zimbabwe in 2002 / 03. Andy Flower's 145 against India in 2002 / 03 is the highest individual score. Sanath Jayasuriya (Sri Lanka) heads the list with 1728 runs in 45 ODIs, with 2 x 100s averaging 43.20. Marvan Atapattu (Sri Lanka) is next with 1199 runs in 29 ODIs with 2 x 100s averaging 46.11. Saqlain Mushtaq's 5 for 38 for Pakistan against Bangladesh in 1997 is closely followed by Muttiah Muralitharan's 5 for 44 against South Africa in 2000 are the best. Muutiah Muralithran leads the list with 55 wickets for 1175 runs in 36 ODIs, with an average of 21.36 (runs / wicket). Sanath Jayasuria comes next with 41 wickets for 1388 runs in 45 ODIs, averaging 33.85 (runs / wicket ). The opening of Rangiri Dambulla International Stadium on 23rd March 2001, Sri Lanka's newest international cricket venue, was an historical event in the annals of cricketing history of the country. The inaugural One-day International was played out amidst much pomp and ceremony and everything went according to plan as Sri Lanka led by Sanath Jayasuriya, defeated England captained by Graham Thorpe by five wickets. Remarkably it was built on a World Heritage Site in the middle of a jungle and to complete this gigantic task in 165 days must be a unique record in the field of construction, in the world. In fact even in early 2000, none even dreamt that there will be an international stadium of this standard in Dambulla in the future, in so short a space of time. Dambulla, just 16 Km from historic Sigiriya, is an agricultural trading town situated in the dry-zone of the country in the North Central province. It is world famous for its ancient UNESCO protected Buddhist Cave Temples which date back to 85 B.C. Few thousand acres of land from where one would hear the drumming in the temple and on a massive rock 200 metres high, was gifted to the Dambulla Raja Maha Viharaya Buddhist Temple by the deed of gift from the then king. Dambulla International Cricket Stadium located here on a 60-acre site leased from this Buddhist Temple, lies 140 Km north-east of Colombo. 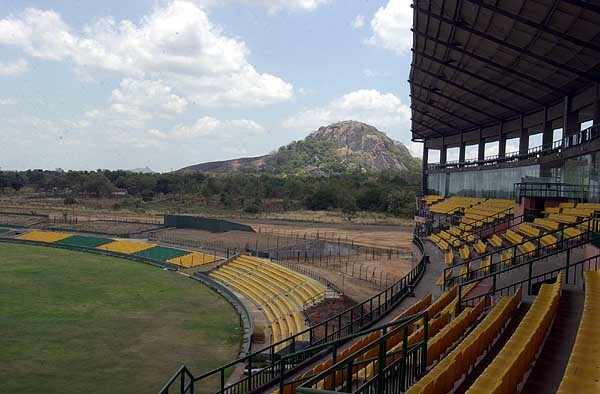 This 30,000-seater Stadium is in a stunning location, looking out over the vivacious Dambulla reservoir , the "Ibbankatuwa Wewa" better known as "Dambulu Jalasaya" and the gigantic Dambulla Rock named "Bulugala Kanda". On one side of this reservoir, is the famous Rangiri Dambulla Rock Cave Temple. On a sun-kissed morning, this picturesque site is a marvel. This project was the brainchild of Thilanga Sumathipala, the current president of Sri Lanka Cricket. (known before as the Board of Control for Cricket in Sri Lanka). He identified the need for an international venue with the potential to host one-day matches throughout the year which was not subject to seasonal weather patterns making cricket impossible in Colombo for part of the year. The concept here was very good to construct an International Cricket Stadium in one of our driest zones in the country. With a rainfall precipitation consistently below 50 inches per year, makes Dambulla ideal even for year round cricket. Over time it has been proved that in the event of unexpected bad weather elsewhere, there is a match venue ready to undertake the task of hosting matches. If Sri Lankan Cricket is to progress and prosper for the future, the facilities and infrastructure improvement in the outstations is crucial and needs priority. The lack of such facilities still drive outstation players to Colombo to further their Cricket, but only a handful can even afford this luxury. Several promising cricketers have fallen by the wayside, as Schools and Clubs in the outstation struggle to find basic facilities and venues to play tournament cricket. With vision Dambulla Stadium could also turn out be the morale booster for the cricketers from north central province. The stadium was originally costed at 190m rupees, but the figure spiralled upwards during construction to a final figure which was estimated at around 425million Sri Lankan Rupees (£2.6m). Unlike R. Premadasa International Stadium, Sri Lanka Cricket Board had to pocket out every single cent of this amount. We need to determine ways and means to recover at least a good proportion of this enormous some and implement a plan of action. The beautiful Rangiri Stadium surrounded by its scenic beauty will afford the fans and their families to enjoy watching cricket and a weekend for relaxation, in ideal conditions. A tour package could be turned out to make such a unique experience in this agricultural district with its religious, cultural and scenic beauty. Hence here we have a wonderful marketing opportunity with great potential to explore judiciously. International cricket finally returned to Dambulla in May 2003 after the inaugural ODI. The venue staged all seven matches of a tri nation tournament due to monsoon rains in the south, but still awaits its first Test Match. The pitch is still bowler friendly but not batsman-friendly, with only one total in excess of 200 achieved during the tournament. It favours the seamers in the morning because of the high water table and heavy sweating and then in the afternoon for the spinners when the pitch can crumble. What we need here in this master piece of construction is the preparation of pitches that can complement the beauty of the ground and its surroundings. Only eight (08) Day - time ODIs have so far been played here. Sri Lanka has played in 05 of them, won 3 and lost 2. The % of success for the Team batting First and the Team batting Second, are equal at 50% each. Side batting first has a Runs / Over rate of 3.44 and for the team batting second it is 3.50. The overall average of runs / wicket here is 18.9. SRI LANKA: 147 / 10 / 49.1 Overs made against New Zealand in 2003. New Zealand made 200 / 6 / 45.2 in chasing a total of 199 / 8 / 50 overs made Pakistan in the Bank Alfalah Tri-Nation Tournament Finals in 2003. Muttiah Muralitharan's 5 for 23 against Pakistan in 2003 and his previous 4 for 29 against England in 2001 are prominent. Muttiah Muralitharan (Sri Lanka) leads the list with 17 wickets for 147 runs in 5 ODIs, with an average of 8.64 (runs / wicket).